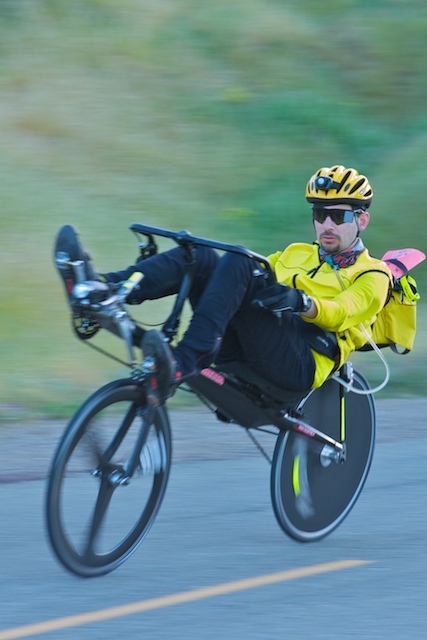 Why should I pay just to check out and test ride some recumbents? I charge new customers $25/hour for consulting, test rides, fitting (if needed), and instruction (if needed). The fee is fully credited toward the cost of any future purchases (bikes, components, or accessories) and I do have a price matching policy — so serious buyers have nothing to lose. I highly value fairness and that goes for this policy. The charge is by fractions of an hour: one half-hour of consulting and test rides is $12.50, 2 hours is $50, and so forth. You can do all the test riding you like in an un-rushed environment, and it is fair to both of us. Because consulting is non-taxable labour, this actually reduces your cost when you make a purchase. For example, if you spend 4 hours doing test rides, the taxable amount of the recumbent you eventually purchase will be $100 less. That saves $9.00 in sales tax. This charge-for-my-time policy originated many years ago, after two incidents when people spent most of a day test riding and were not heard back from. One of them then ordered a bike direct from the manufacturer! It was that very manufacturer who suggested the policy. The effect of the policy is to weed out uncommitted customers. This lets me give more time and higher quality service to my serious customers. I am expert in this field — people who have consulted with me have found the service well worth it, even if they ended up buying a used recumbent elsewhere. The fee is only for first-time customers. After you buy a recumbent from me, technical support and future consultations and test rides are all free. What is your mail order policy? I sell bicycle components and accessories mail order and can send them to most any country in the world through the United States Postal Service, which I find to be the best value for shipping small packages. I also sell by mail order all recumbent bicycle and tricycle brands I carry, with the exception of Bacchetta and Catrike which don't allow mail order sales. I ship recumbents via FedEx and United Parcel Service. There is no minimum order and no handling charge. You pay only the actual shipping cost. I will give you a shipping price quote at the time of the order quote. Shipping price is based on destination postal code, package weight and — for large packages — package size. Do you sell used recumbents? However, in the long run, due to replacement parts needed or out of warranty frame or seat repairs a used recumbent can end up being more expensive than a new one. Do you work on recumbents? I do maintenance and repair work on all aspects of recumbents except for wheels, frames and composite fairings. My labour rate is $70 per hour, discounted to $60 per hour on recumbents that have been purchased from me. All sales are final unless I have a need for the item one wants to return. I like to educate my customers so they know what they are getting and it fits their needs so they will be satisfied and will want to keep it for a long time. I do not rent recumbents because I don't have insurance coverage for rentals.